Having an eternal love for the night sky, Mark (aka. Space Cadet) has been working in the Astronomy field since 2012. Beginning as a volunteer star-viewing tour guide at the Perth Observatory, then taking up the role as a Lecturer and Astronomer at the Gingin Observatory between 2013 and 2016. 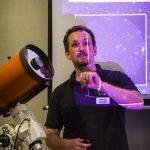 To further his passion for sharing the Wonders of the Cosmos, Mark began Earthside Astronomy in February 2015 and has not stopped learning and sharing Astronomy with the world. With over 13 years of experience in the field of water monitoring and control, Mark has a deep understanding of the monitoring and usage of water and groundwater in Australia. Marks passion for sustainable water usage has lead him to share his knowledge of ground water systems in the hope that uncontaminated water is available for everyone into the future.